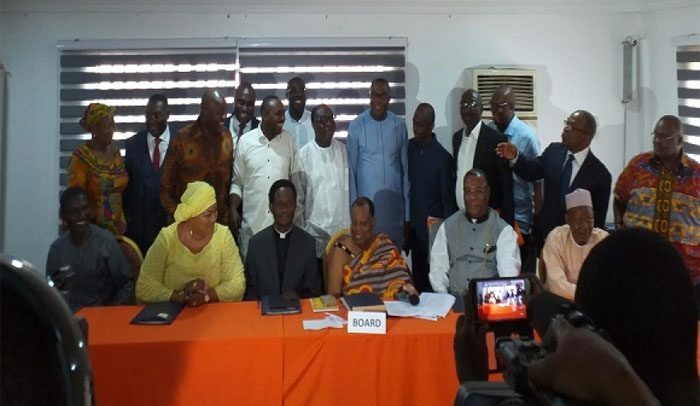 The Ghana Peace Council (GPC) yesterday hosted the country’s political parties ahead of their scheduled talks on stemming vigilantism in the country. Although the engagement was done behind closed-doors, DAILY GUIDE can confirm that it was about the GPC presenting a draft of the ground rules to the political parties. Following President Akufo-Addo’s proposal for a bipartisan discussion between the ruling New Patriotic Party (NPP) and the main opposition National Democratic Congress (NDC) on the subject of vigilantism in the local political setting, the latter differed with him on the modalities. The President fired correspondences to the National Chairman of the NDC on the subject presenting his alternative views. Eventually, one of the areas of contention- mediator – was agreed, hence the involvement of the GPC to play that role. Therefore, yesterday’s engagement was the first movement towards the commencement of the discussions scheduled for next week. A number of proposals would be laid before the two main parties for consideration as a means to disbanding vigilante groups. Yesterday’s meeting was scheduled for the Central Hotel, near the British High Commission, Accra, and was preceded with an April 2 correspondence signed by George Amoh, Acting Secretary of the Council on behalf of Chairman of the GPC, Most Rev Prof Emmanuel Asante, to invite the two parties’ representatives for the discussions. “For effective discussions, each party is respectively expected to bring not more than seven representatives,” the invitation letter stated. The date for the actual meeting to talk about the disbandment would be set after the Central Hotel meeting yesterday. President Akufo-Addo, in the midst of the hullabaloo over the modalities for the meeting, made a statement that he could call for legislation on the subject of vigilantes with no prejudice to the planned discussions by the political parties. Eventually, he ordered the Attorney General to commence the process of a legislation which is ongoing.